It’s time to admit, my organisational skills have been slightly all over the shop recently (no let’s be honest for the whole of the past year). Through 2017 I tried desperately to find a healthy balance between working a 9-5 job whilst also juggling part time blogging and all the while living an enjoyable social life. So any plans of regulated blog content pretty much went out of the window as I tried to maintain a way of fulfilling all of these aspects of my life. Although I am not one for setting myself New Years resolutions or spouting prosperities of New Year New Me, I am one to see the New Year as a new start. A fresh page. A way of kick starting yourself into finally doing those things you’ve been lecturing yourself for the past year to start doing. For instance in my case, just generally being better organised with life. I pride myself on being a bit of a whimsical spontaneous old soul but I do appreciate that there are some things that could be better structured. I always feel if I just kept a little more order in my life it would open up so many more windows to do more things, more time for evening cinema trips, coffee with friends and even just nights in front of the sofa snuggled up with Ollie. Not only could my work/social life be a little more organised but also my skincare and hair routine certainly needs a pick me up after this dismal winter. As some of you will know over the past few years I have dabbled with dying my hair at home (a very gentle way of putting it, imagine a lot of DIY bleaching) and my hair suffered rather a lot from this. It was incredibly dry, brittle and prone to breaking off. In fact last Summer I was at a complete loss with what to do with my hair because I had essentially destroyed it. The only thing I could do was quit the box dyes, go for the big chop and allow my hair to recover from all the damage I had inflicted. Fast forward seven months and my hair is in the best condition it has been in a long time, and I am very intent on keeping it this way. To be honest I have also never been one to experiment too much with my hair care brands. I buy my shampoos and conditioners in Tesco’s whilst I do my food shop. I normally have a go to however will trifle with other brands if they are on special price and I don’t really have a particular routine. Wash lather and rinse is just about it. So with my fresh page of 2018 I feel I have a lot to learn with taking better care of many aspects of my life. Thankfully I have my wonderful friends at Percy and Reed to help me finally kick start my ‘New Year, New Page’ campaign with a little 2018 survival kit. 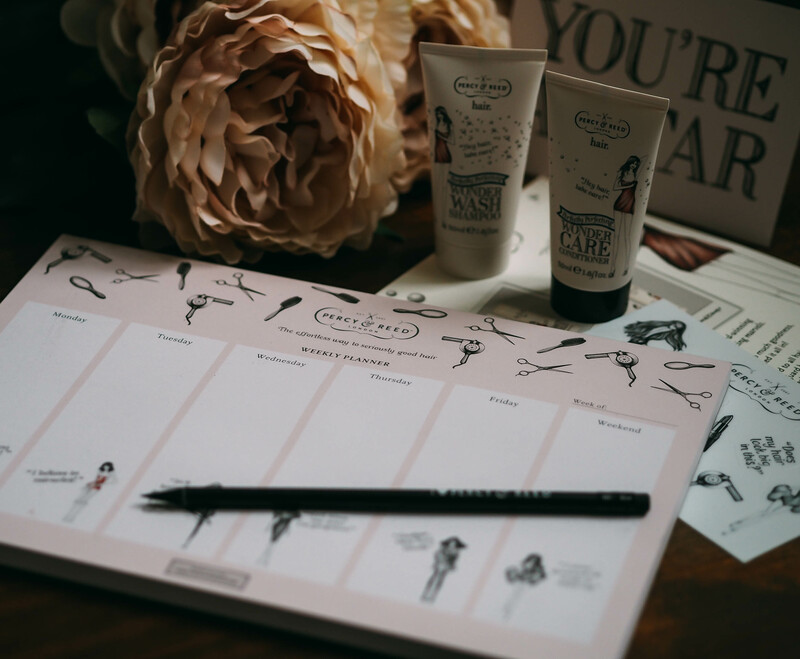 Not only did they send me some lovely little samples of the new Wonder Wash range to try out but also a weekly planner pad along with some super cute bits which is just what I need to help whip me into shape with my new ‘get more organised’ mindset for 2018! If you don’t know too much about this quintessentially British brand, let me fill you in. Firstly Percy and Reed are actually two wonderful hairdressers! Who then went on to turn their skills of cutting the hair of the rich and famous to opening up their own salons for everyone to enjoy. After that they decided to release their own range of fabulous hair products which can be found not only on their website but stocked in many great retailers such as M&S, John Lewis and Amazon! 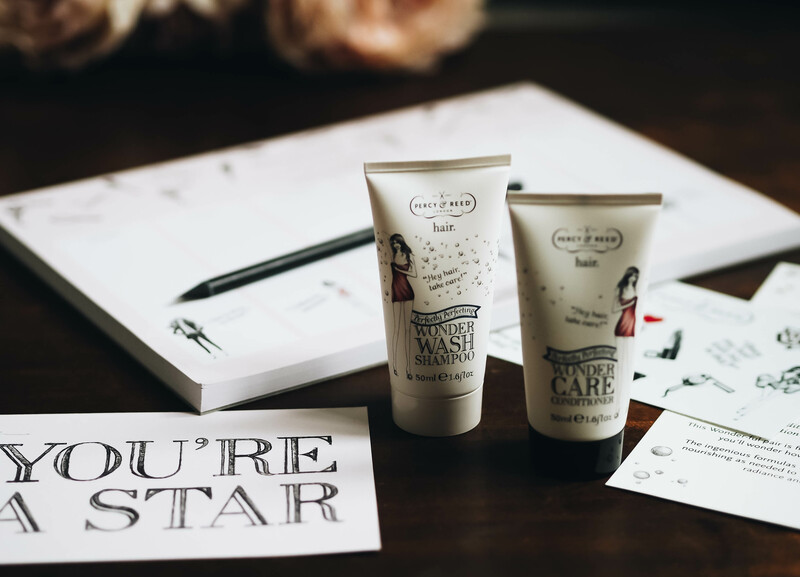 Hard to miss with their beautifully curated packaging this brand has become a household favourite for many beauty fanatics out there. 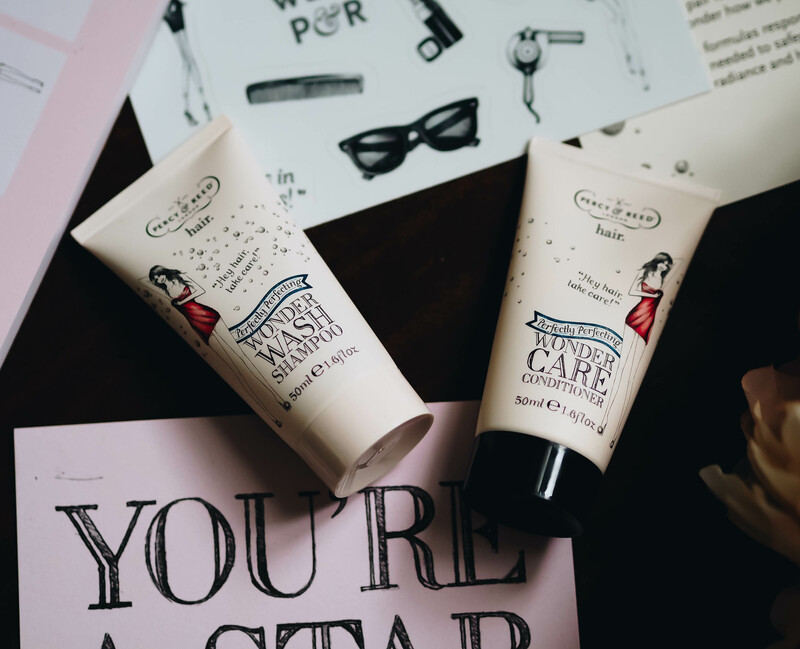 Latest on their line is the Wonder Wash Shampoo and the Wander Care Conditioner. The Shampoo: The ultra mild & dermatologically tested formula has been created to nourish roots, condition your lengths and help repair any damaged ends. It is also cleverly designed to help weatherproof your hair and uses Pro vitamin B5 to strengthen it from the inside to out. The Conditioner: With soothing ingredients like Aloe Vera this conditioner is designed to help detangle all hair types. Plus with Sunflower seed extracts included it will help protect and repair coloured hair, working to bring back that silky radiance you lust for. Plus like the Shampoo, it is filled with B5 pro vitamin goodness to help reduces split ends. Squeeze a walnut sized drop on to hand. Lather into hair and rinse. Easy as that. If you love a fresh fragrance then this brand is the one for you. It’s the kind of scent that when you breathe it in you just feel, well clean. You know the scent right? I adored the smell as soon as it touched my hands and even more as I began working it into my hair. Though I didn’t get as much lather as expected I did still feel like a walnut sized drop was the perfect amount to get it worked through right to my ends. The same could be said for the conditioner too, a walnut sized drop was just the right amount to work into my ends. I could also feel as I ran my fingers through my hair with the conditioner in, that wet silky feeling you get when you have a really good moisturising conditioner working it’s magic. I tend to wash my hair every couple of days. After using the Percy and Reed combo I would get to day two and feel like if I really fancied it, I could wait even another day to wash my locks. My hair felt clean, and smelt it too. It hadn’t gathered grease and had not turned into a frizz ball after the shower of rain I walked through on my lunch break. My hair was for once, behaving itself. 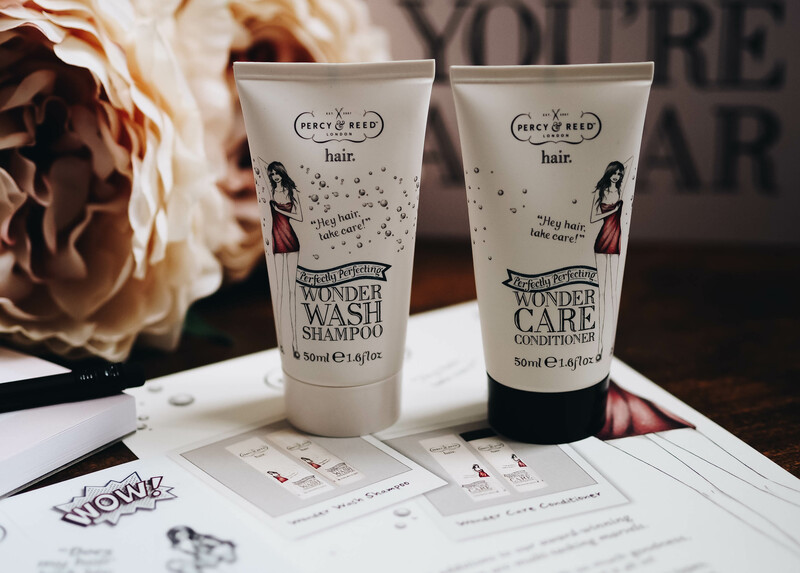 Overall the wonder wash/care range is perfect for someone looking for a product with a gorgeous fragrance and an ability to keep hair at optimum conditions, after all it was created by two men who know hair better than most. Though the prices may be a touch on the costly side as I said just last week I would never recommend a product which I wouldn’t happily use myself and this is safely within that category. Plus a little bit really does go a long way so I can see this product is going to last. I can guarantee as soon as these two run out I will be repurchasing asap! *These items were kindly gifted to me however all opinions are my own. "Why I Enjoy Being An Affordable Lifestyle Blogger"
"Saying Goodbye To The January Slump"